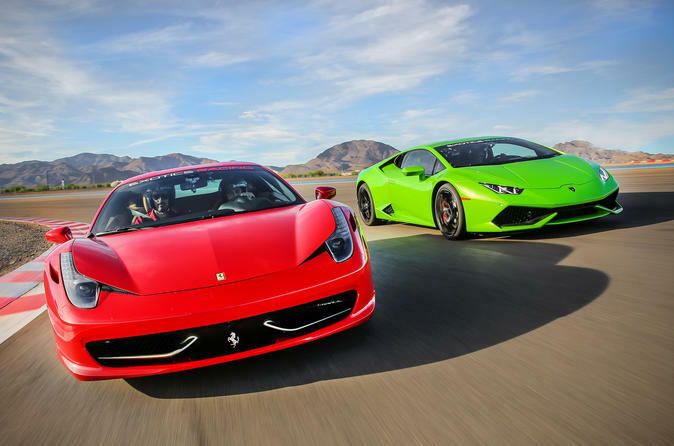 Is your dream to get behind the wheel of a Ferrari, Lamborghini or Porsche? Now it’s time to stop dreaming and start driving! Select your favorite exotic car and speed around a private race track for five to six laps of adrenaline-pumping fun. Before you get behind the wheel, you will learn proper driving position, steering techniques, proper racing lines, braking and acceleration with powerful cars and much more. The beauty of this experience is that you don't have to know how to drive a manual transmission. All of the vehicles are paddle shift, so they easy to drive at any skill level. Next, you'll be taken as a passenger for two discovery laps in a Porsche Cayenne with a professional driver showing you how to optimize your laps on the track. Now you are ready! It's time to get behind the wheel of your chosen vehicle and unleash your inner Fangio on the racetrack and push the limits of the car`s performance with one-on-one coaching from a professional instructor. Special Offer - Book by September 30, 2018 for travel any time and receive one (1) extra lap! - Book Now!